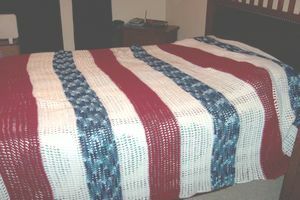 Editor’s Note: This American Beauty Afghan is a pattern meant to be crocheted in patriotic colors – red, white and blue for America, of course, as shown in Kathy’s photographs. However, the colors can easily be changed to represent those of your own school, sports team or patriotic allegiance. You can make this an afghan or a bedspread. I used an “L” hook and my finished size was a large blanket of 85″L x 85″W, but you can vary the measurements, providing you always use even numbers when making the starting chain. The hook will help decide the size, although you can always add extra stripes of color if you want more length. Single crochet in 2nd chain from hook and each stitch thereafter to the end. Chain 2 and turn. YO Pull up a loop in the first stitch, YO pull up a loop in the next stitch. 3 loops on hook. YO and pull through 2 loops, then YO and pull through 2 loops. Stitch complete. Chain 3 turn. 3 loops on hook. YO and pull through 2 loops, YO and pull through 2 loops. Continue in this manner to the end of the row where you will do 1 double crochet in the last stitch completed. are 8 sections of white and four sections of each color. Repeat row 2 until you reach the desired length. Released by Kathy Brown by Creative Commons License 3.0.